Sometimes you may find that the videos recorded with your AVCHD camcorder can only play on the camcorder and you want to burn them to DVD so that you can view them on home DVD player or TV with family and friends. In this article, you are going to learn how to burn AVCHD to DVD with custom DVD menus for playing on your DVD player or large screen TV. To achieve the goal, you need a DVD burning software that supports burning AVCHD videos. Aimersoft DVD Maker will give you a hand in burning AVCHD files from digital camcorders like Sony, Canon, Panasonic, JVC, etc. to DVD for view on any standard DVD player or TV. In addition to AVCHD, this DVD burner can also burn DVD from videos in a variety of video formats, including WMV, MOV, MP4, AVI, MKV, VOB and more and lets you edit your videos by trimming, rotating, adding watermarks, etc. Furthermore, the built-in free customizable DVD menu templates take your DVD movie to the next level instantly. And it's fully supports the latest Windows 8. If you're using a Mac, you can turn to the perfect Mac AVCHD to DVD converter called Aimersoft DVD Creator for Mac to burn camcorder AVCHD videos to DVD on Mac OS X (Mountain Lion and Mavericks included). Now download the program and follow the wizard to finish the installation. Get a blank DVD (DVD +R, DVD-R, DVD+RW or DVD-RW)) onto the rewritable DVD-ROM on your computer and follow the guide below to convert AVCHD to DVD effortlessly. Now just read on and follow the tips here to finish your task in Windows easily and quickly. Mac users can also take the steps below. The main interface of the software is as below. Run the program and click Import to add the AVCHD videos you want to burn. You can also directly drag videos to the left item bar for burning. When the videos are loaded, you can adjust the video sequence. Note: Please pay attention to the green bar that shows your video size to make sure your video doesn't exceed the capacity of your DVD disc. By selecting a video clip, control-click it, you'll go to the Video Edit window, where you can edit your videos by trimming, adding watermarks, applying special video effects and more and even inserting subtitles. Next, click the Menu tab to select a DVD menu template you like. There are different styles of built-in templates, frames and buttons for your choice. You can even add text, background music and background image to customize the menu. When all settings are OK, click the Preview button to preview the DVD to make sure everything is what you want. At last, insert the DVD disc into your computer's DVD drive. Click Burn tab to begin burning your AVCHD files onto the DVD disc. AVCHD is the file format of choice when creating high definition video from digital recording hardware. It is the file format created by Panasonic and Sony for use with their camcorders. AVCHD follows the H.264 or the MPEG-4 AVC standard. The file can also support 3D or stereoscopic video resolutions. Its audio system may follow the Dolby Digital compression. AVCHD is also the more preferred format for transferring media files into a disc for it also supports the use of recordable memory cards, DVDs, hard disk drives, and solid state memory. The file can be played through a compatible Blu-ray disc player and the PlayStation 3 console. It also supports direct playback on the camcorder to a television set. USB and computer playback are supported as well, especially by compatible media players such as the VLC Media Player, Windows Media Player, and QuickTime. Sony HandyCam to DVD: Have recorded videos with Sony HandyCam and want to burn them to DVD? This article shows you the way. VHS to DVD: Wondering how to convert VHS videos to DVD? Follow the tutorial to start your task. Sony DCR to DVD: If you are looking for a way to burn Sony DCR videos to DVD, you can turn to the article to get the solution. Hi,Jim. 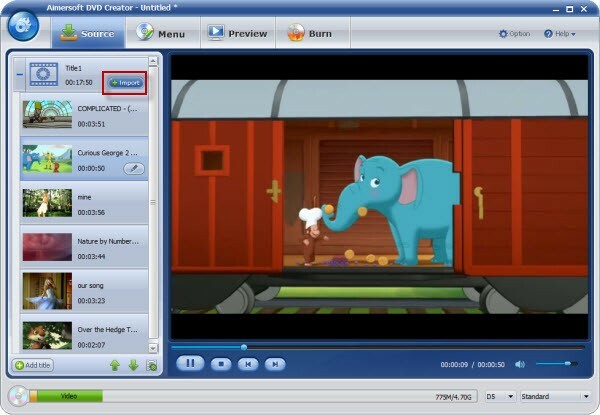 DVD Creator has a built-in video editor, which enables you to trim, rotate, crop videos, add text watermarks, apply special effects, and adjust the video color etc. You can add personalized background music to the photo DVD slideshow. 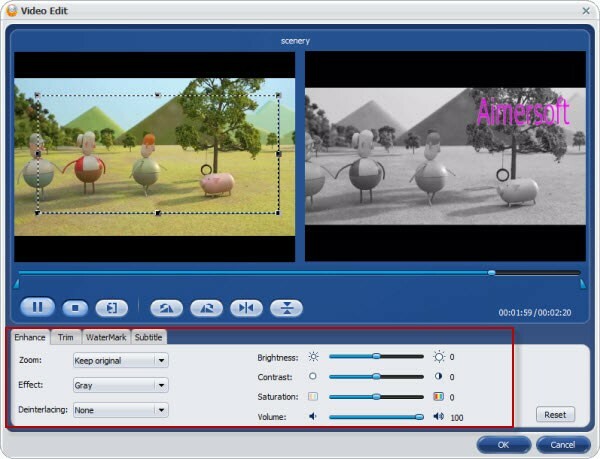 But if you want to replace the video audio with different audio, you can turn to Aimersoft Video Editor, which is more professional and powerful in video editing. Just purchased Aimersoft DVD creator yesterday. Guess I'll find out when I get into it but I was wondering if you can directly edit videos in it like a movie maker. ( I want to replace the video audio with different audio, or do I need to do that first with a movie maker before importing to DVD creator)? It sounds really interesting! I will try it and see if it really does what it promises.